My much- and often-revised story "God of Chickens" will appear in the official magazine of the Australian Horror Writers Association, Midnight Echo, issue #5. The issue should be on Australian newsstands at the beginning of 2011. This is my first non-Lovecraftian story to see notable print, and I'm rather pleased. I suspect that will make it difficult to obtain here in the United States, but I have queried the AHWA about getting some copies. If you're interested in a copy, send me an email or make a comment to this blog post. I'll do what I can. Armistice Day, Yet Again. What Have We Learned? It's Armistice Day, or Veterans' Day, depending on your personal point of view. Some people have the day off, and there's probably a big sale going on. Just take a moment and think about what today is for. Remember those who have served in the military. What did they see, what have them done? Remember those who didn't come back, whose mothers and brothers miss them. And remember those who didn't come back whole, those with post-traumatic stress disorder, or brain damage. Remember those missing an arm, a hand, or a leg. Make sure you voted to send them out for something worth that. I don't usually post songs, but Carbon Leaf's "War Was In Color" is a good, solemn tribute, and appropriate for the day. 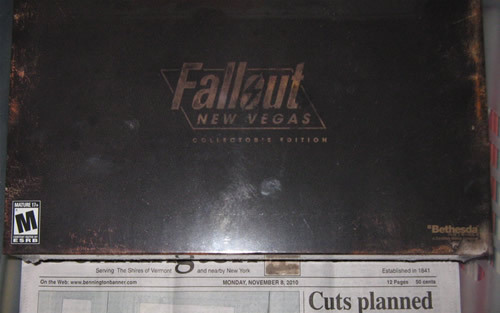 For two running nights, I've dreamed of playing Fallout: New Vegas. Yay. If I was the sort to believe in personification, I'd be wrapping this bad boy in tin foil. I'm sure it has something to do with the fact that I'm rereading the best novel about Vegas ever: Tim Powers' Last Call. But there it sits, wrapped in plastic like Laura Palmer, untouched except when I put newspapers under it to confirm the date.